What is the one accessory Gen Z cannot live without? Mobile phones. In a recent survey we conducted to see which devices our students own, Gen Z came on top in terms of smartphone ownership (29%). 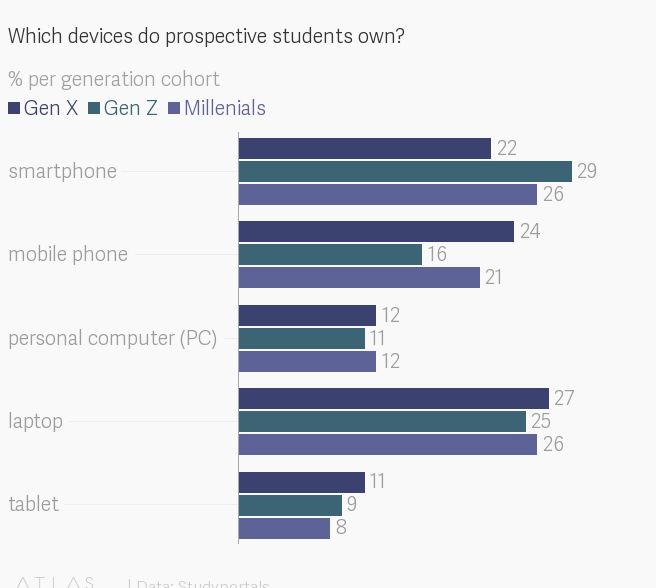 The second most popular device among Gen Zers was their laptop (25%). Teenagers don’t just use mobile phones to keep in touch with their peers, but to do everything else that they deem important in their lives, including searching for their next study destination. Recently we noticed that Studyportals Bachelors, our portal aimed at younger prospective students looking to start their undergraduate degree abroad, has made a shift towards mobile as the most popular device students are browsing, overtaking desktop devices for the first time, with 49% of users preferring to look for their next study destination on their phones. 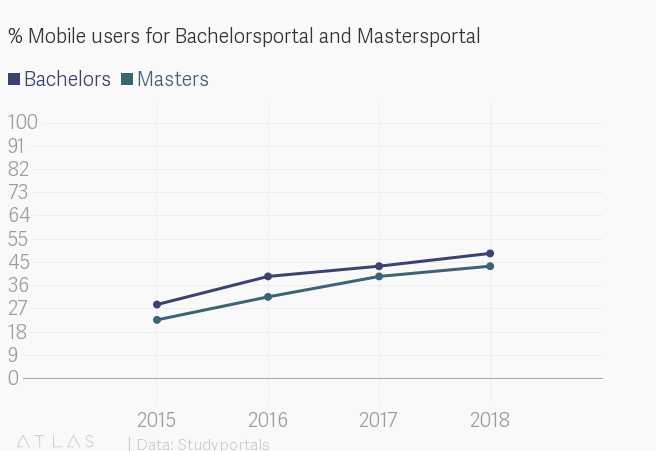 Studyportals Masters is also slowly growing in terms of mobile users, having reached 44% already, whereas 55% of users still prefer desktop devices. Surprised? We hope not. A recent research by Google, mentioned that getting a phone is one of the most important life events for Gen Z, and that it’s happening earlier than ever, on average at the age of 12. If there’s one thing that’s sure is that there’s a new generation of students heading over to campuses worldwide and that they are bringing with them some new challenges to university presidents, student recruitment officers and international offices alike. Generation Z, iGen, or whatever else you want to label them, are not only officially college-bound but they also currently make up 32% of the world’s population. What sets them apart from the previous generation of students? For starters, they are super connected and have never known a non-digital world. Gen Zers are used to a level of convenience and accessibility no other generation has known before them. They have been at the forefront of exponential advances in mobile technology which has now become the primary choice for accessing the internet. This is especially important to those vying for the attention of their student target audiences. In a world where digital is becoming such an important part in the student journey, universities have no option but to put digital and mobile at the forefront of their efforts of getting students’ attention. This not only means having a great mobile-optimized website but also thinking about a comprehensive mobile engagement strategy. Whatever it is, be it your website, an email or your social media communication, must look good first and foremost on mobile. Think of first impressions in the digital world, as you would in person and put your best foot forward in all your communication, regardless of the medium. That means making sure your website is optimized for mobile, that you test your email communication on mobile as well to make sure the content is still easy to skim. Some good tools to consider are the Google Mobile-Friendly Test, or the mobiReady tool that can give you a website score and make recommendations on what should be optimized. We would advise especially testing the key landing pages students need to take on your website to find the right information and apply. These include the programme enquiry pages, contact pages, application requirements pages, and especially your application form. Teenagers spend most of their time on mobile consuming video content (3+ hours every day). With YouTube becoming as popular as Google in answering some of the students’ most burning questions, having a strong online video presence is key to attracting their interest. In addition to videos showcasing your campus, sports teams, or events, also consider including student testimonials about life on campus for added authenticity. A good example is that of University of Leeds. In a relatable fashion, the video walks prospective international students through the application process, and how the university helps with accommodation. Another great format is how-to videos. Those can help students understand your admission process, answer burning questions about expectations from candidates, and bring a human touch to a rather confusing and frustrating process for most students, international or not. Some thorough examples come from Loughborough University explaining the UCAS application process for the UK; Cambridge University detailing their interview process; and Harvard explaining the financial aid process to help students navigate a rather complex topic. While students will still use email to submit their final applications, they do expect universities to be easier to reach. In our survey, what students found most overwhelming about university websites was simply finding someone to answer their questions. This was true for both Millenials and Gen Z. Having an email address and an international phone number is no longer enough, and students expect more real-time communication with the people behind the admission process. Having a live chat, Whatsapp, Skype, Messenger would help your institution look approachable and responsive to what students need. This way students could reach out directly from their phones and find a person and have their questions answered quickly. These activities are anything but easy to manage at scale, but with a few tricks and scripts, they become more manageable. You can borrow some ideas from our previous Whatsapp article. Your social media is a key part of your digital mobile strategy. Students will most likely follow your school once they’ve short-listed the schools they will apply to. Making sure that this is a great place to remind them of upcoming deadlines, share inspirational stories of your existing student cohort, and simply showcase what life on campus will be like can make an impact on their decision. Facebook, although growing more unpopular with Gen Z, is still their go-to channel for engaging with universities, followed by Instagram and YouTube. While Snapchat is very popular for keeping in touch with friends, students mentioned it was not a channel they expected to engage with universities. Mobile sets the stakes high. Students are now empowered with an ever-increasing plethora of information that they expect to access conveniently and effectively from the comfort of their phone. 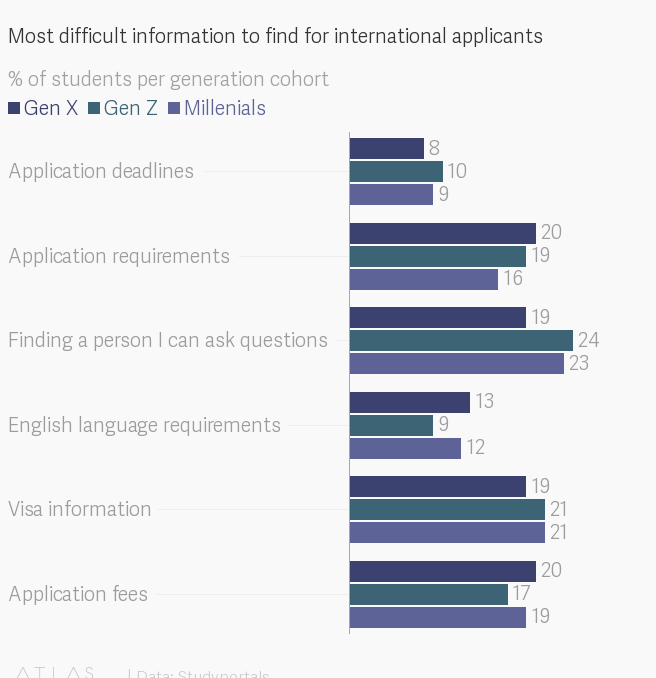 Recruiting international students requires a mobile-first strategy, and a laser focus on personal communication. Do your part to meet students where they are – on the mobile platform – and empower them to make this decision conveniently and effectively.